Plus, watch the cinematic opening for Street Fighter V: Arcade Edition. The Season 3 Character Pass for Street Fighter V will add Sakura, Blanka, Falke, Cody, G, and Sagat to the roster of playable characters, Capcom announced. Sakura will be the first to launch alongside the release of Street Fighter V: Arcade Edition on January 16, 2018. Coming up first is the exuberant youth herself, Sakura! Making her first appearance in Street Fighter Alpha 2, she has now graduated from high school and searches for a deeper meaning of life, all the while continuing to challenge her rival, Karin, and her idol, Ryu. This time, Sakura has a few new moves in addition to her signature emulation of Ryu’s playstyle. All of the updates included with Street Fighter V: Arcade Edition will also be added to the base version of Street Fighter V, which is available now for PlayStation 4 and PC, via a free update. Read more about Street Fighter V: Arcade Edition here. If you missed it earlier this week, read up on each character’s new V-Trigger IIs here. Watch a trailer for Sakura and the cinematic opening for Street Fighter V: Arcade Edition below. View the first screenshots of Sakura at the gallery. This time, Sakura has a new move, Tengyo Hadoken, where she fires a fireball diagonally into the air that can act as an anti-air. In addition, her V-System that is detailed below gives her more tools to open up opponents. 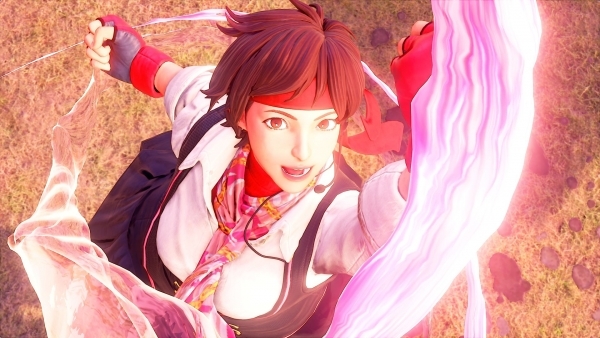 Overall, Sakura’s fighting style remains similar to her past appearances as she pummels opponents with flurries of quick attacks along with her trademark Hadoken, Shouoken, and Shunpukyaku. Sakura leaps into the air towards the opponent, which can then be followed up by three different options. Hitting punch will result in one of her signature moves, Sakura Otoshi, which can be pressed up to three times to continue the combo. Following up with a kick will trigger Oukakyaku, a forward flip that can act as a divekick. Finally, pressing throw (LP+LK) after Haru Kaze will result in Kashinfu, a command grab that that sees Sakura using her opponent as a spring board to jump back. Upon activation, Sakura’s fists are enveloped by blue energy that powers up Hadoken and Tengyo Hadoken, giving them both an additional hit. Landing a hit will also cause your opponent to be put into a juggle state giving you an opportunity to land additional attacks. She can also press HP+HK again to use Hogasho, a powerful palm thrust. This time, Sakura’s fists and feet become enveloped by blue energy that powers up Shouoken and Shunpukyaku. Landing a hit will send your opponent flying into the air where you can cancel into V-Skill to follow up with either Sakura Otoshi or Oukakyaku. Both moves are improvements to their EX version and can be performed up to four times before Sakura Senpu ends. With as long as Sakura’s been around, there’s a great deal of nostalgia with her return to Street Fighter. We’ve decided to tug on those strings even more by adding her classic stage, Kasugano Residence, into Street Fighter V: Arcade Edition complete with her adorable dog and younger brother, Tsukushi.